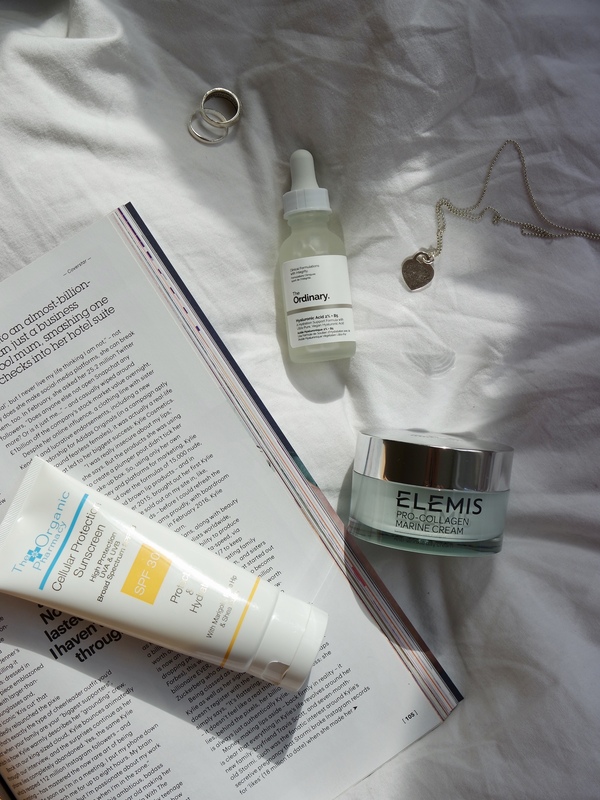 Here’s my lazy girl guide to hydrated, plump skin, even in those dark, cold winter mornings. While in the evening I spend a good 10 minutes (it doesn’t sound like a lot, does it?) on my skincare routine, in the morning I just do not have the time. I usually have just opened my eyes and brushed my teeth, and it’s already time to leave the house, so I prefer having a quick and easy routine. Three products make up my morning skincare. Curious to find out which ones? Read on. Which are the three skincare products you need? You don’t need a complicated skincare routine to achieve glowing skin. Especially in the morning. All you need is the perfect base, which for me consists of three product categories – a hydrating serum, a hydrating day cream and, of course, sunscreen. Here are my three. This particular serum has been present in my routine for a while, and for a reason. One, it costs £5.90, so even my bank account likes it. Two, it boosts your skin’s moisture and makes it look nice and plump. Three, it works well with most skin types, and especially with dry and dehydrated skin, as it brings it back to life. You can use it morning and evening, after cleansing and before moisturising. I massage a few drops on my face before moving on to the next step. Even Simon loves it, so get on it, guys! This one is my fancy step. 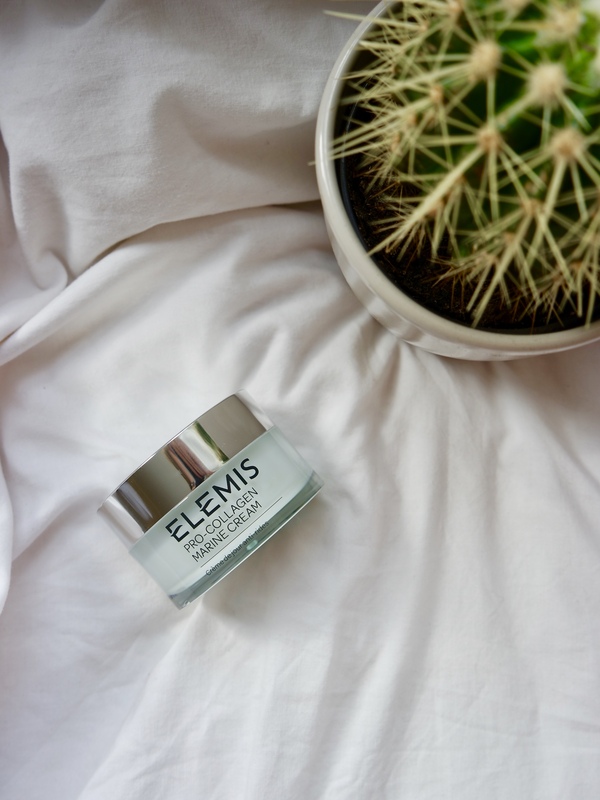 I had tried the cream before, as I had a few samples and fell in love with it, but the £80 price tag combined with a student/recent graduate budget made me say no to my addiction. Luckily, it came in full size with last year’s Elemis advent calendar, so my skincare dreams came true. Technically, it is an anti-ageing moisturiser, but it’s never too early to start using preventative measures, amirite? Its active ingredients include a Mediterranean seaweed called Padina Pavonica (hence the ‘Marine’ in the name) which helps moisturise and firm the skin, ginkgo biloba, which is rich in antioxidants that help protect the skin against free radicals, and rose and mimosa absolutes, which give it a lovely scent and have calming, anti-inflammatory and toning effect. We’ve talked about how important using a sun cream daily is, even in winter. The sun might not be shining nearly enough these days, but this doesn’t mean the bad UVA rays don’t reach us. Of course, you won’t get burns in winter, unless you’re skiing, but you still need to protect your skin. 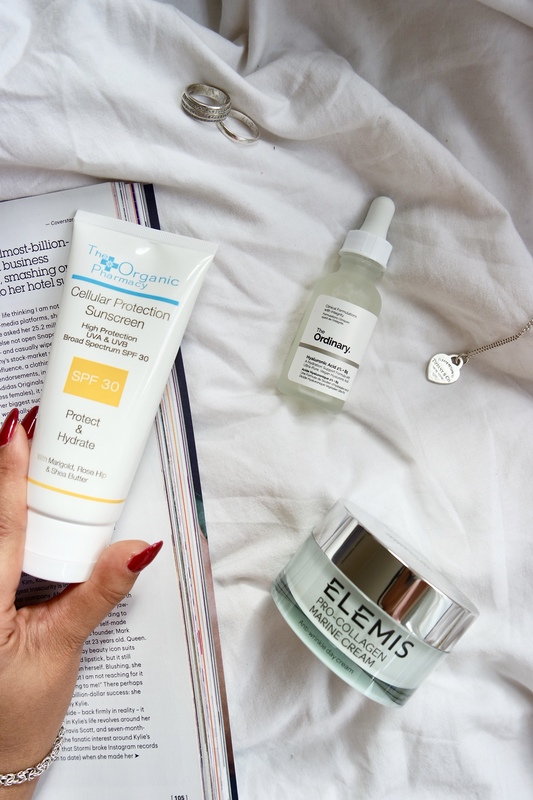 The Organic Pharmacy SPF 30 is one I’ve been using since the summer, and I love how it’s moisturising, as well as protective. It is a mineral sunscreen, which has titanium dioxide and zinc oxide working together to create a barrier to physically prevent the sun’s radiation from damaging the skin. It is gentle enough to use on babies, so this is always a good sign. Of course, it will block both UVA and UVB rays, which is what you want from a good sunscreen. Another thing I like about it is that it doesn’t feel greasy, it absorbs into the skin fast, and does not leave a white residue. And this is it. These are the products that currently go on my face every day. Of course, if I feel I need something else, I will add it to my routine, but this is my base and I am very happy with it. I use The Ordinary Marine Hyaluronics, it’s perfect for keeping my skin moisturised and I love how I only need three drops for my whole face. I need new SPF so I’m definitely going to check out that one. Same with the HA, so little goes a long time! This SPF is AMAZING!! These look really good! I’ve still yet to find skin care products that work for me. I might try these out!